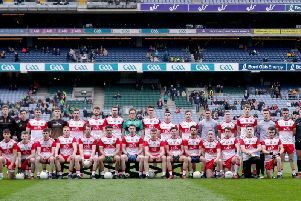 Two goals in two second half minutes sent Derry through to the Ulster Minor Championship semi-final after an impressive display from Damian McErlaine;s young Oak Leafers in the Celtic Park curtain raiser on Sunday. Tiarnan Rushe’s goal two minutes into the second half looked to have given Down control of a tight game but Derry responded with a brilliant individual effort from Patrick Coney and Shane McGuigan’s excellent finish to put Derry in a lead they never looked like relinquishing. The opening exchanges were ‘nip and tuck’ between two evenly matched teams deploying conservative approaches. Glass was listed at half-forward but immediately dropped back into a sweeping role following throw-in and it took three minutes before either team troubled the scoreboard, Down’s Aaron D’Arcy registering the game’s first point. Derry were level five minutes later when a patient build-up ended with Patrick Kearney placing Shane McGuigan for a nice score. The team continued to swapped points with Tiarnan Rushe on target for the visitors and Dungiven’s Fergal Higgins, one half of two sets of Derry twins playing, sending over a brilliant point. When Higgins was then pulled back by Conor Cox, Glass sent Derry into the lead for the first time on 10 minutes from the subsequent free but Deaglan Morgan replied two minutes later. Shane McGuigan and Aron Magee again swapped points before Derry’s started to gain a degree of control. First the Oak Leafers turned Down over inside their own half which left the impressive Jack Doherty with a chance to point before another Glass free put Derry into a two point lead at 0-6 to 0-4 on 25 minutes. The home side’s half time lead was three after a fantastic Shea Downey point ended the opening 30 minutes with Derry leading 0-7 to 0-4. Derry good finish to the first half was undone within two minutes of the second half when Down’s Tiarnan Rushe took a pass from Charlie Carr and produced a superb solo run through a packed Derry defence before levelling the game with a fantastic low finish across Callum Mullan-Young and into the net. Thirty seconds later the Mourne men were in front at 1-5 to 0-7 when Aron Magee scored a free after Steelstown’s Eoghan Concannon was adjudged to have over-carried. Just as Down looked to be taking control though, Derry went through the gears. First Fergal Higgins brought the sides level before Doherty sent Derry back in front. Down responded with points from D’Arcy and Rushe which had the teams level for a seventh time before the visitors edged ahead. Then came the Derry salvo which won the game. When Patrick Coney set off on a run upfeild he seemed to be looking to a colleague to pass to but as he accelerated away from every challenge, the Loup man found himself 20 yards from the posts. he may have been shooting for a point but instead floated a lovely finish over the stranded Jack Heaney and into the net for 1-9 to 1-7. Two minutes later Derry were in control when Glass won the ball at midfield and sent Shane MCGuigan away through the middle to produce another excellent finish and Derry were in the driving seat. A Glass free seconds later made it seven Derry points in three minutes and the game was and home hands. Down tried to rally and threatened the odd goal chance but with Glass dropping back into full-back and looking equally assured there, Derry managed the remainder of the game superbly as the visitors lost Rushe to a late black card as Down frustrations surfaced with time ticking away. Down: Jack Heaney; Conor Cox, Patrick Murdock, Dean McLaughlin; Charlie Carr, Mark Harte, Pierce Laverty; Frank Aiken, CJ Barr; Deaglan Morgan (0-1, 1f), Jody McGovern, Aaron D’Arcy (0-2); Conall Gordon, Tiarnan Rushe (1-2), Aaron Magee (0-2, 2f). (Subs) PJ Davison for J McGovern, 39mins; Darragh Connolly for F Aiken, 41mins; Nic Turkington for C Gordon, 47mins; Owen Donnelly for T Rushe (Black Card) 56mins;Oisin McConvey for C Carr, 60mins.